This Demonstration simulates a single-winner election for one to five candidates using four common voting systems: first-past-the-post (FPTP, AKA plurality voting), instant-runoff voting (IRV, AKA alternative vote, transferable vote or Hare system), Borda count and approval voting. 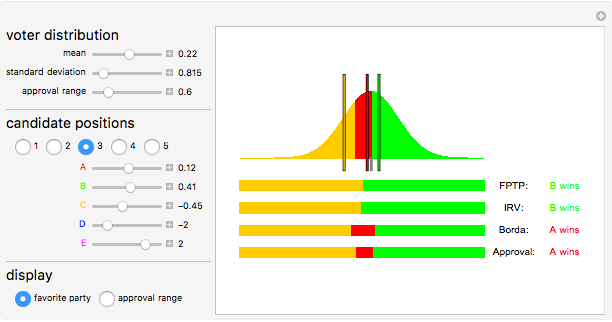 The voting population follows a normal distribution (with adjustable parameters) along a single ideological spectrum, while each candidate's position (which is also adjustable) lies at a specific point on the spectrum. The bell curve can be colored to display either regions where each candidate is the favorite or intervals over which voters approve of each candidate. Below the bell curve shows which candidate would win under each method for the given voter distribution, as well as a colored bar showing which candidate would win if the mean voter (AKA the center of opinion) were centered at each point on the spectrum. This Demonstration is based on a Flash program by Ka-Ping Yee . For the three ranked voting systems (first-past-the-post, instant-runoff voting and Borda count) we assume that voters prefer candidates in descending order of ideological distance from themselves. For the single cardinal voting system (approval voting), we assume that voters approve of candidates within a fixed range and disapprove of candidates outside of that range (if no candidates are within their range, they abstain). We also assume that everyone votes honestly, and do not model tactical voting. The purpose of this Demonstration is to show how much of an impact the voting system can have on an election. In a single-winner election with only two candidates, there is obviously only one fair way to decide on the winner: ask each voter which candidate they prefer and take the candidate that more voters prefer. When there are more than two candidates, it is not nearly as straightforward, and different voting methods can produce different results . This Demonstration includes several of the most common voting methods . The first three are ranked voting systems, in which each voter ranks the candidates from most preferred to least preferred, with no ties allowed. First-past-the-post counts only their first choice, and the candidate with the most first-choice votes wins. Instant-runoff voting iteratively drops the candidate with the fewest first-choice votes from the race, giving their votes to the next candidate in their voters' preference lists, until one candidate achieves a majority of first-choice votes (this simulates the effects of conducting several consecutive runoff votes). Borda count for a race with candidates gives a candidate points for each first-choice vote, points for each second-choice vote, for each third-choice vote, and so on, finally giving point for each last-choice vote, and the candidate with the highest total score wins. The final voting system, approval voting, is a type of cardinal voting system. Each voter assigns each candidate a score of 0 or 1, and the candidate with the highest total score wins. In addition to showing how each of the different voting systems can produce different winners even when given the same set of ballots, the Demonstration can also be used to display some unusual or undesirable properties of some voting systems. Examples are included in the snapshots. Snapshot 1: The spoiler effect of first-past-the-post. Candidate A is the candidate agreeable to the largest number of voters and would easily win under any system if not for the presence of the small third-party candidate C. This splits the left-leaning vote enough to allow right-leaning candidate B to take the win under first-past-the-post. Snapshot 2: If candidate C moves closer to the center, becoming a bigger third-party candidate, then instant-runoff voting also exhibits a spoiler effect. This also demonstrates how the different voting methods treat centrist candidates. First-past-the-post and instant-runoff voting tend to push out centrist candidates who are flanked too closely by more extreme candidates. Borda count and approval voting are more generous toward candidates agreeable to more people. Snapshot 3: Non-monotonicity of instant-runoff voting. Instant-runoff voting can occasionally display non-monotonicity, meaning that moving the center of opinion closer to a candidate's position can actually hurt their chances of winning the election. This is indicated in the colored bars when discontinuous bands of color appear. In this screenshot, there is a region near the center of the spectrum where moving closer to candidate A causes us to move from a region of candidate A winning to a region of candidate B winning. 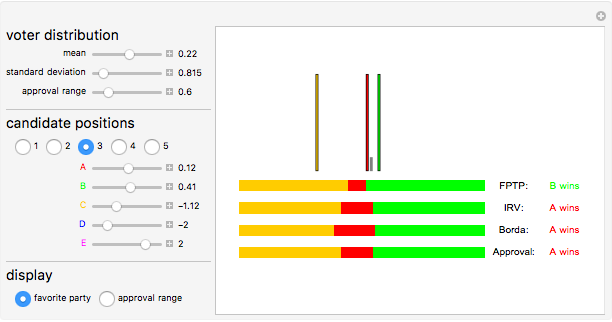 Snapshot 4: Displaying overlapping approval ranges. K.-P. Yee. "Election Methods in Pictures." (Nov 13, 2017) zesty.ca/voting/voteline. C. Börgers, Mathematics of Social Choice: Voting, Compensation, and Division, Philadelphia: Society for Industrial and Applied Mathematics, 2010. E. Pacuit, "Voting Methods," Stanford Encyclopedia of Philosophy, fall 2017 ed. (E. N. Zalta, ed.). (Nov 13, 2017) plato.stanford.edu/archives/fall2017/entries/voting-methods. Adam Rumpf "Comparing Voting Systems for a Normal Distribution of Voters"